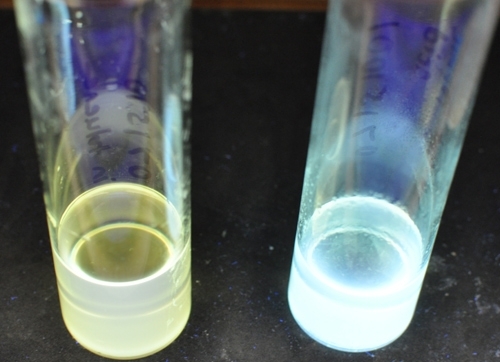 Vial holding original white light quantum dots on the left and the enhanced quantum dots on the right. With the age of the incandescent light bulb fading rapidly, the holy grail of the lighting industry is to develop a highly efficient form of solid-state lighting that produces high quality white light. One of the few alternative technologies that produce pure white light is white-light quantum dots. These are ultra-small fluorescent beads of cadmium selenide that can convert the blue light produced by an LED into a warm white light with a spectrum similar to that of incandescent light. (By contrast, compact fluorescent tubes and most white-light LEDs emit a combination of monochromatic colors that simulate white light). Seven years ago, when white-light quantum dots were discovered accidentally in a Vanderbilt chemistry lab, their efficiency was too low for commercial applications and several experts predicted that it would be impossible to raise it to practical levels. 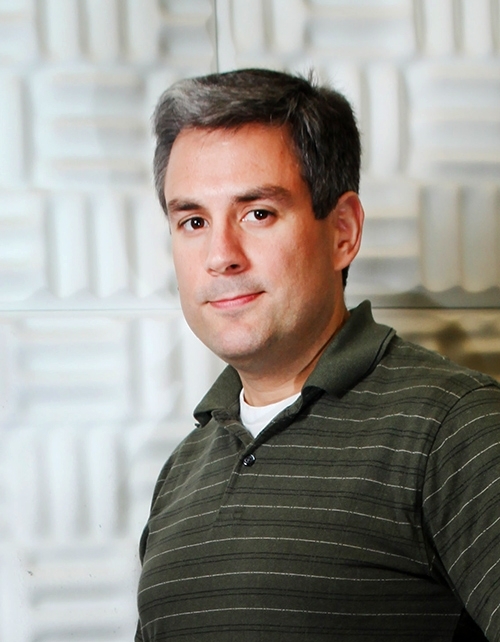 Today, however, Vanderbilt researchers have proven those predictions wrong by reporting that they have successfully boosted the fluorescent efficiency of these nanocrystals from an original level of three percent to as high as 45 percent. 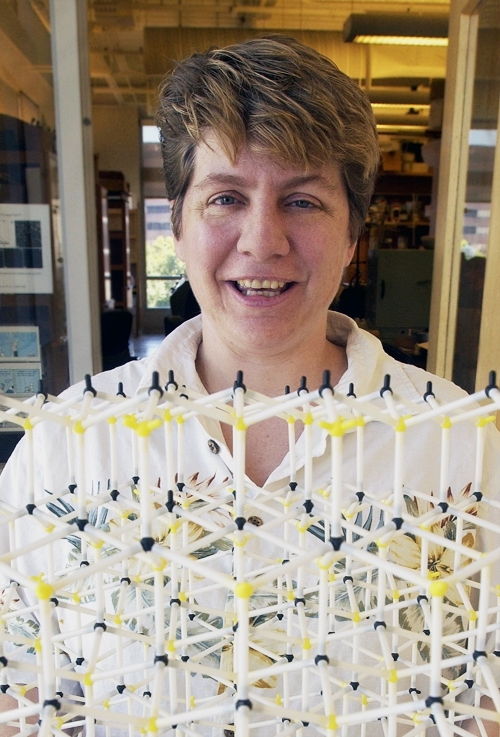 Sandra Rosenthal holding a model of a white-light quantum dot. The general measure for the overall efficiency of lighting devices is called luminous efficiency and it measures the amount of visible light (lumens) a device produces per watt. An incandescent light bulb produces about 15 lumens/watt, while a fluorescent tubes put out about 100 lumens/watt. White light LEDs currently on the market range from 28 to 93 lumens/watt. Quantum dots were discovered in 1980. They are beads of semiconductor material – the stuff from which transistors are made – that are so small that they have unique electronic properties, intermediate between those of bulk semiconductors and individual molecules. One of their useful properties is fluorescence that produces distinctive colors determined by the size of the particles. 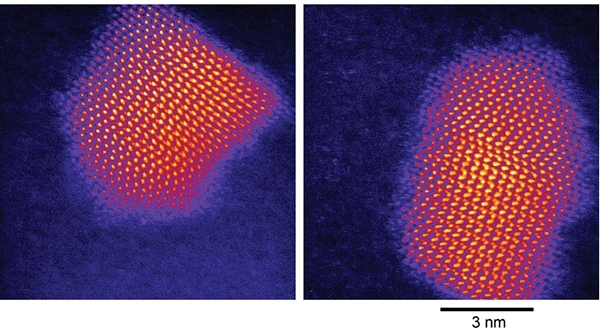 As the nanocrystal’s size shrinks the light it emits shifts from red to blue. The Vanderbilt discovery was that ultra-small quantum dots, containing only 60 to 70 atoms, emit white instead of monochromatic light. “These quantum dots are so small that almost all of the atoms are on the surface, so the white-light emission is intrinsically a surface phenomena,” said Rosenthal. One of the first methods various groups used in the attempt to brighten the nanocrystals was “shelling” – growing a shell around them made of a different material, like zinc sulfide. Unfortunately, the shells extinguished the white light effect and the shelled quantum dots produced only colored light. Following a lead from some research done at the University of North Carolina, the researchers decided to see if treating the quantum dots with metal salts would have a brightening effect. They noticed that some of the salts seemed to produce a small – 10 to 20 percent – but noticeable improvement. The decision to follow their nose proved to be fortunate. The acetic acid treatment bumped up the quantum dots fluorescent efficiency from eight percent to 20 percent! Acetic acid is a member of the carbocyclic acid family. So the researchers tried the other members in the family. They found that the simplest and most acidic member – formic acid, the chemical that ants use to mark their paths – worked the best, pushing the efficiency as high as 45 percent. The brightness boost had an unexpected side effect. It shifted the peak of the color spectrum of the quantum dots slightly into the blue. This is ironic because the major complaint of white-light LEDs is that the light they produce has an unpleasant blue tint. However, the researchers maintain that they know how to correct the color-balance of the boosted light. The researchers’ next step is to test different methods for encapsulating the enhanced quantum dots. Other contributors to the study include graduate students Teresa E. Rosson, Sarah M. Claiborne and undergraduate research student Benjamin Stratton, who is now at Columbia University. The work was supported by a grant from the National Science Foundation.